Yoho National Park holds some of the Canadian Rockies' most beautiful scenery. The Canadian Rockies are home to some of the most beautiful and best preserved parks in the world. Although Banff and Jasper National Park are both within driving distance of Golden, it is Yoho National Park, only a 30-minute drive away, that grabs the attention on this side of the Canadian Rockies. As far as National Parks go, Yoho is definitely one the most well known. 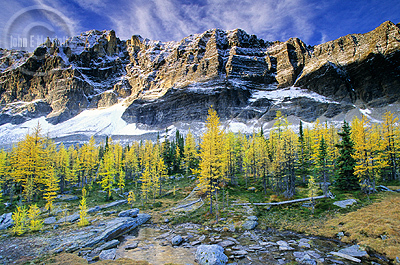 Yoho National Park was created in 1886 and encompasses 1,310 square kilometres of the Rocky Mountains Western slopes. The park’s name, Yoho, is a Cree word used for expressing awe and amazement. It also sounds better than WOW National Park. The park’s glacial lakes, stunning waterfalls, impressive snow covered peaks and majestic forests ensure that any visit will be awe inspiring. The park is home to snow topped peaks and many waterfalls including the world famous Takakkaw Falls, and the park’s glaciers are responsible for providing the silty runoff that creates the deep turquoise colour of Emerald Lake and Lake O’Hara. Its history is bound with railroad spiral tunnels inside mountains and stories of runaway trains. As well, one of the world’s most important fossil finds, the Burgess Shale, is located in Yoho. Designated a World Heritage Site in 1981, the Burgess Shale Formation contains the fossilized remains of more than 120 marine animal species dating back 515 million years. Join SunDog Tours on a fun-filled day of wildlife spotting and hiking through the Canadian Rockies. BOOK an airport shuttle service with us and and take in our breathtaking Rocky Mountain scenery. CLICK HERE!. We also provide year round Private Charter Transportation services with luxury vehicles and professional drivers and guides throughout Western Canada. Take a direct flight. Fishing, beach and fun in the rain forest. CLICK HERE!